Operation G.O.O.D. (Giving Of Ourselves Day) is an annual serve-a-thon. Students in kindergarten – 8th grade ask family, friends and neighbors to sponsor them in a two hour service project on the first Friday in May. For the last several years, Heritage students have worked alongside the Army Corp of Engineers in the State Parks surrounding the Coralville Reservoir. Students have developed an excellent reputation as hard workers, making the most of the two hours they work. This fundraiser is also designed to support the annual operating budget and, as with other fundraising, God has provided in excess of what we planned. Each year, the goal is to raise approximately $25,000. If you have a Heritage student visit you asking to be sponsored for this event, consider the far-reaching impact your sponsorship has. Your support is impacting the lives of over 210 students! Operation G.O.O.D. 2015 Breaks Records! 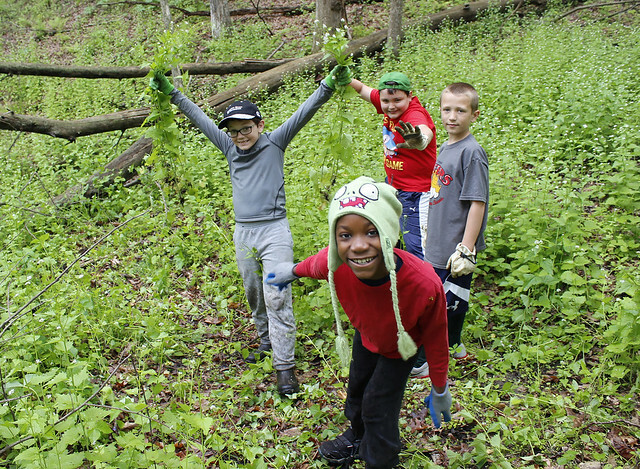 The students, parents and staff pulled TWICE AS MUCH garlic mustard weed as our highest year and MORE THAN ANY OTHER GROUP that has ever volunteered in the area! OVER 4 TONS of weeds and wood debris were gathered. We are blessed to have such a hard working group of students that take stewardship of God’s creation seriously.